Lauren and I started reading this aloud to each other last year and for a reason I can’t remember we stopped reading it halfway through. It had nothing to do with the content of the book. It’s a young adult novel, so it’s clean. And we certainly didn’t put it aside because it was boring. It was anything but. In any event, something came up, and we set it aside and forgot about it. When I saw the sequel, Peter and the Shadow Thieves at the bookstore, I remembered that Lauren and I had never finished the original, and we took the original off the shelf and jumped right back in. So much time had passed since we had last read it, that we had to go back and review. But soon the story came back to us, and we were back in the middle of the action. And there’s plenty of action. 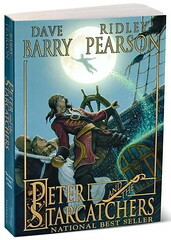 Peter and the Starcatchers is the story of how Peter Pan became Peter Pan. How Captain Hook became Captain Hook. How Tinkerbell and mermaids came to exist. How the lost boys came to be and why they can’t fly like Peter can. As you can see, it’s the story of Neverland, the prequel to the early twentieth century play Peter Pan. I don’t want to give away any of the story. You should have the pleasure of discovering all the backstory yourself. To even hint at some of the events would lessen the surprise. Suffice it to say that Peter and the Starcatchers is a wonderfully magical, thrilling, touching, altogether wonderful read. How Lauren and I were ever able to set it aside unfinished is a mystery. The last 100 pages are a thrill ride. You can’t put this thing down. Everything about — with the exception of the number of typos it has — is perfect. I felt like a kid again.